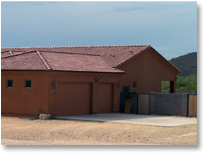 Hays Roofing has been leading the roofing industry in the Valley for over 70 years. We always provide an excellent service and stand behind our work. Our roofing installers are fair, honest, loyal and dependable. We stand behind each and every job and guarantee the strength, beauty and accuracy of our craftsmanship. We are licensed, bonded and insured and invite you to check out our exemplary record with the Arizona Registrar of Contractors or the Better Business Bureau. Call Hays Roofing today for a Free Estimate or Request Information Today about Hays Roofings professional roofing installation and re-roofing services! Phoenix, Glendale, Peoria, Scottsdale, Cave Creek, Avondale, New River, Paradise Valley, Sun City, and all surrounding areas.